Elegant and unique Emerald Key dress made in 2009. Would fit a dancer between 5’1 and 5’4 best. The bodice is made of black stretch velvet, green fabric with gold details and gorgeous embroidered stars that really make the dress! 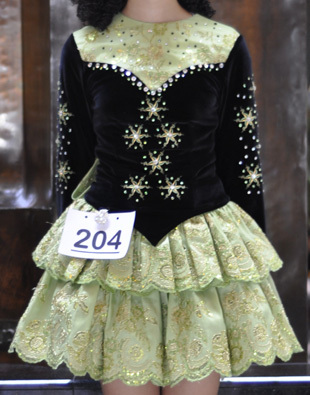 Up to date soft skirt is 2 layers of green fabric that can be lengthened or shortened, very lightweight and easy to dance in. Photos do not do the intricate details of the fabric justice! 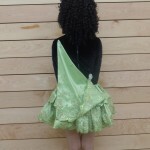 The back has a matching soft cape of green fabric. Green, black and AB rhinestones are distributed throughout. This dress has been stored in a smoke-free home and is in almost brand new condition with no stains or odor. Comes with bundies, green headband, bustle for “poofing” the skirt and brooch for fastening the cape. Additional photos and measurements available upon request. The skirt can be brought up 2 inches or extra fabric can be added to lengthen it. Since bodice is stretch velvet the chest and waist measurements are forgiving.